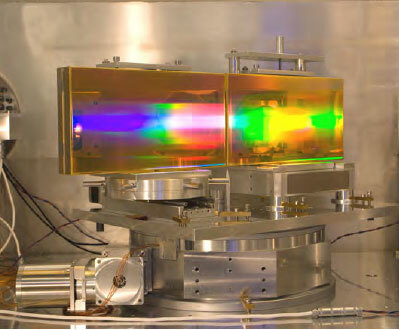 (Nanowerk News) Ultra-short pulsed lasers are no longer used mainly in the laboratories of basic researchers. They are an important part in the industry for cutting, surface finishing and pattern recognition and also in medical science. In medical science amongst others they are in place for the detection of cancer cells. Experimental set-up of the grating adjustment system. In an experimental set-up (please see figure 1) for the generation of high energy ultra-short pulsed lasers lithographically produced gratings need to be adjusted within a few nanometers each to another. These gratings decompose and assemble the laser spectrally. The adjusting degree of freedom needs to be smaller than 70 nm or 80 µrad. Where the adjustable mass can weigh up to 20 kg (44 lbs), a 5-axis control (3 rotary and 2 translational axes) is necessary to adjust the laser under these conditions. Because of the control it is possible to monitor the position of each degree of freedom. The reached position has to be long-term stable with uncertainties of a few nanometers. Otherwise a modular set-up is required. Controlled motions of single figure nanometers have been tested and confirmed in a first laboratory set-up (see figure below). With an active adjustment control these parameters can theoretically be hold for an infinite time. Single steps scaled down to 1 nanometer could be realized without any risk. Measurement of the long-term stability of the new design.